Generally, when updating to new iPhone, the most significant thing is to transfer the contents, media files and music from old iPhone and to the new iPhone without losing any data.Of course, there are some ways to make it. Why not choose the best and easiest way to transfer everything from your old iPhone to new iPhone X or iPhone 8 (Plus) to make your life easy. Using iTunes can help you to store old iPhone backup to computer and restore backup to new iPhone X/8 (Plus). It requires your computer to have enough free space. Step 1: Install and Launch the newest version of iTunes on the computer. Step 2: Use Apple USB to connect old iPhone to the computer. The iTunes will detect it. Step 3: Click on old iPhone to show the control panel on the right side and click on Back Up Now. Step 4: When the backup processes ends, disconnect the old iPhone. Now connect new iPhone X/8/8 Plus to computer. Step 5: Click Restore Backup in iPhone X/8 (plus) control panel. Choose the backup files of old iPhone and restore it. The disadvantage of transferring the data via iTunes is that there is no direct data transfer. If the data is not restored to new iPhone then it will overwrite the existing data. Files that are synced from iTunes, such as synced MP3s, movies, books, photos, etc. Using iCloud can help you to store old iPhone backup to iCloud and restore backup to new iPhone X/8 (Plus). It requires you to have enough iCloud space. 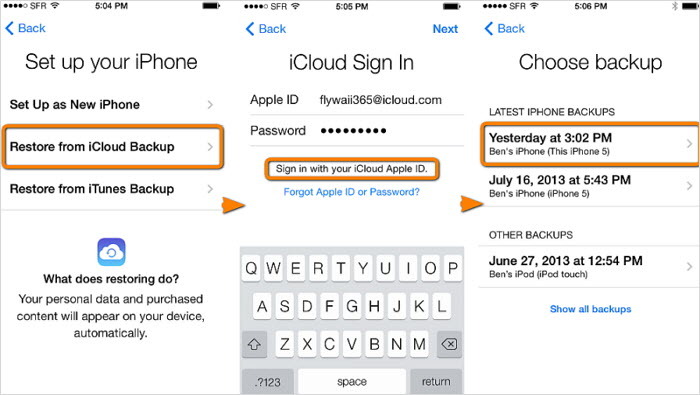 Step 1: On your old iPhone, go to “Settings > iCloud”. Step 2: Click on Backup option and proceed with Back Up Now option. Step 3: Take the iPhone X/8 (Plus), set the Language & Network and Click on Restore from iCloud Backup. Step 4: Sign in to Apple ID and choose the backup files to restore. The single disadvantage of transferring the data from iCloud is that it works as a medium and there is no direct data transfer since Apple only gives 5GB free space. No matter you use iTunes or iCloud to transfer everything from old iPhone to new iPhone X/8/8 Plus, it doesn’t include the purchased files in iTunes and files that are imported to iPhone. You need to re-download the purchased files from iTunes, but as for the free and imported media files, you will lose them. The method below will introduce you the way to transfer all the media files from old iPhone to new iPhone, including purchased and non-purchased music, movies, playlists, podcasts, audiobooks, iTunes U, etc. By using iMyFone TunesMate iPhone Transfer, users will find transferring media files from iPhone to new iPhone very simple. It can make up what iTunes and iCloud backup don’t include. 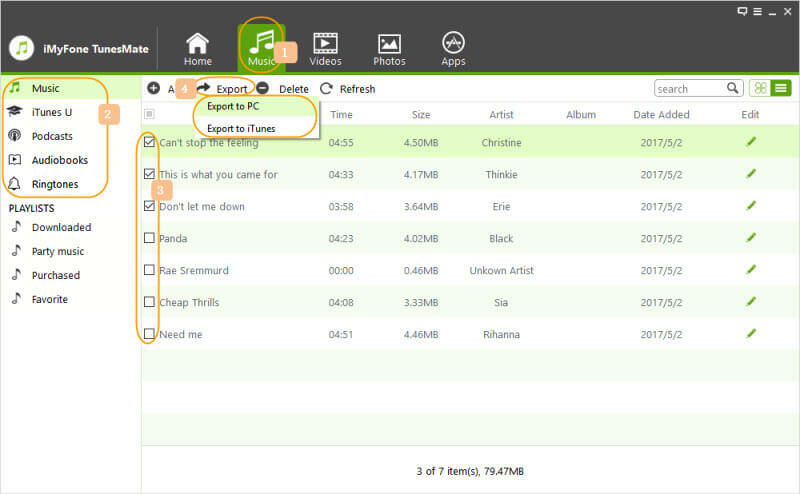 It moves the media files between iPhone, Mac, PC and iTunes. This is commonly used for transferring files from or to iPhone. Transfer All Media Files: music, movies, podcasts, iTunes U, audiobooks, home video, playlists, photos, albums and much more. Backup & Restore: Backup all media files of iPhone and restore backups to new iPhone even signed into different Apple IDs. Purchases & Non-Purchases: Unlike iTunes, it includes all the purchased files from iTunes or other store, or the free downloaded files. Transfer to/from iPhone: Sync files to iPhone from computer, iTunes, external HD, etc without erasing; extract files from iPhone for backup. Step 1: Install iMyFone TunesMate and run on PC and connect your old iPhone. Step 2: Select the tab from the top menu that the user wants to transfer to computer, like Music. Select the files and use the “Export > Export to PC” to backup the files. Step 3: Now connect new iPhone. Use the “Add” function and select the backup files to restore. Step 1: Launch TunesMate iPhone Transfer and connect your old iPhone. 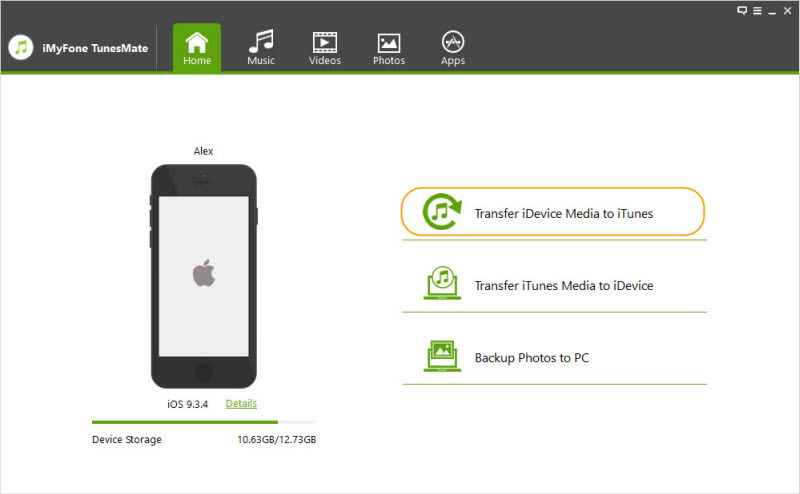 Step 2: Go to “Transfer iDevice Media to iTunes” and continue to backup the media files to your iTunes library. Step 3: Connect your new iPhone and go to “Transfer iTunes Media to iDevice” and restore the files to new iPhone from iTunes library.